We all have them. Those shadowy mysterious figures in our pasts whom we’d love to sit down with over a cup of coffee, just to try to get to know them. One of mine — the closest of mine — was born 122 years ago tomorrow. And I never knew him. He died 13 January 1945 in Chicago, Illinois, of cancer, at the age of 53.3 It would be some years yet before my birth. He never laid eyes on any of his grandchildren except my oldest brother, my father’s son by his first marriage. He would be a stranger to me if he were sitting across that coffee table from me this morning. And yet.. and yet… I have this wistful sense from everything I know about the man that I would have liked him. I know he spent his earliest childhood there in the village where he was born. The family moved to Gera before he was 10.4 I don’t know, yet, what his schooling was, but we have a photo of a young boy in uniform and I have to wonder if perhaps he wasn’t in some sort of military school. I know he was in the German Army — a gefreiter — probably closest to a private first class — in the German Army in World War I. His term of service began at least as early as 1912 (he was photographed sitting with his troops in Danzig in 1912) and continued to perhaps as late as 1918 (he wore a German Army uniform at his wedding in February 1918). Hugo Ernst served in the Grenadier-Regt. 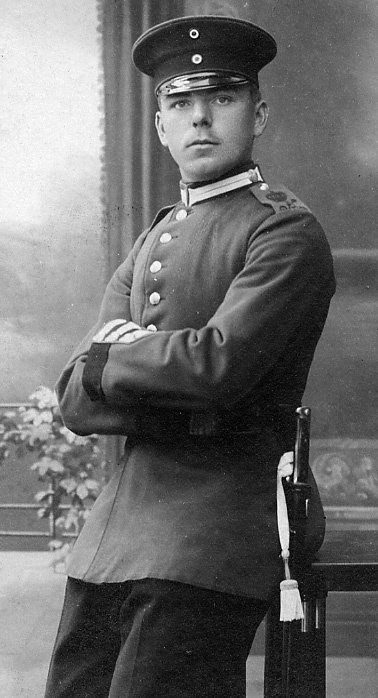 König Friedrich I (4.Ostpreußisches) Nr.5 (Danzig) XVII Armee Korps, and in the Danziger Infanterie-Regt. Nr.128 (Danzig; III Bn Neufahrwasser) XVII Armee Korps. And Hugo Ernst gathered up his little family and took them to America on the SS George Washington in early 1925; they landed in New York on 6 February 1925.8 He had family already there — two aunts,9 an uncle,10 cousins11 and even three sisters12 who had come before and were waiting in Chicago when he brought his small family over. And there he worked, hard, in hard-labor jobs, all the years until his death. He was a coal foundry worker and day laborer the entire 20 years he spent in Chicago. But he laughed. And he made people laugh. For a costume party in the 1920s, he pinned the high-denomination currency of inflation-ridden post-WWI Germany to his suit and ran around the room. When asked what in the world he was doing, he said he was “galloping inflation.” His costume won first place. He’s the one you see in later photos playing in the lake or in the park or on the playground with his son. He’s the one who made the Sunday tradition of a chicken dinner and a strawberry cake where you didn’t have to ask permission to have a second piece. He’s the one with the smile on his face when the rest of those German immigrants wore their poker faces. He’s the one even my father’s first wife enjoyed being around. And he’s the one I wish I had been able to know. Even if just long enough for a cup of coffee and a chat. Judy, what a lovely tribute to your grandfather. Wow, he died at such a young age. What a clever idea for a costume. He sounds like he was a wonderful, hard-working, and loving family man. Jana, you’re far too kind as always. Thank you! You told this so beautifully Judy. It’s wonderful that despite the fact that he died before your birth, you are able to share so much about him. Thanks, Michelle, and what’s really remarkable about it is that my father was so very secretive about his family. I’m amazed at times I ever learned anything from him about his side of the family at all. Such a wistful post…just my feelings on some of my ancestors whom I would have loved to know as well. My grandfather was secretive about his family too. Only found out what I knew from my grandmother, who shared the stories with me. Well-written tribute, Judy! Thanks, Deb. The word “wistful” is so right to describe how I feel about this… how we all feel about this. Thank you, Judy. Your story brought tears to my eyes. My paternal last grandfather died when I was three months old and my maternal last grandmother died when I was nine months old. I grew up with no grandparents to love and spoil me. I’m always felt – deprived? But it isn’t just grandparents. I’ve often wished for my mother to sit across the table from me and share a cup of tea. Not to pick her brain about genealogy, but just to be there. At age 70, I am now the oldest remaining member of my family. I miss them so much!! I love the “galloping inflation” costume. He sounds like a really interesting person. I loved that story, Karla — one of the reasons why I sure think I would have liked him. Too late I discovered he was alive and well in Oklahoma until I was 28 years old. Two years later I got an address for his second wife and corresponded a little with her. I finally got two pictures of him, too — not from her but from a third cousin whose grandmother kept the family photos that her siblings sent her. It’s too bad you never had a chance to meet him, Barbara. What a shame. I have a grandfather I never met too, Judy. The hardest thing is that he was alive until I was 30ish years old and I had no relationship with him because my mother had no relationship with him. Her parents divorced when she was about 10 and after that she rarely saw him. I count my blessings, though, because my grandmother remarried so I did have a Grandpa but the mystery around my biological grandfather is strong. I wish I’d been interested in genealogy back then because I definitely would have contacted him – but in respect to my mother I never did. Sigh. Sigh, for sure, Debi. Sorry you didn’t have the chance to at least meet him. What a wonderful tribute to your grandfather. It was sweet and really enlightening as to his personality and his life, even though you only knew him through family stories and the genealogical records you have found. One of the things I find so fascinating about your posts, Judy, is your very detailed attention to detail and source bookmarks. I appreciate that and have tried to follow your example on my blog. I fall short, however, most of the time. It is one of the things that I must continue to work on. Thanks for the kind words, Judith! Much appreciated.